Poinsettias are commonly found in North American homes during the holidays. However, these tropical plants can thrive year-round like those growing in their native Mexico and Central America. Poinsettias have come a long way from the days of Aztecs growing 10-foot ceremonial poinsettia trees and employing the showy red bracts for uses as varied as extracting red dye and formulating fever-reducing medicines. Vibrant red bracts and dark green leaves characterize the most familiar types of poinsettia, but the 100+ cultivated poinsettia varieties have leaves and bracts of many sizes, colors, and combinations. 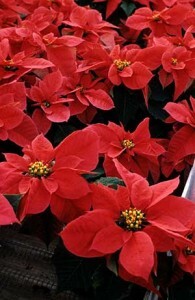 Outside of their native climate, poinsettias are primarily grown indoors. A few tips will help you keep your plant healthy year round. Place plant where it receives sun for at least six hours each day but shade during hot afternoons and evenings. Avoid temperatures below 55°F and above 75°F and hot or cold drafts which may cause leaves to drop. Keep soil moist, watering when the surface feels dry or the pot feels light when picked up. Discard excess water from the drainage tray so that the plant does not sit in water. Once flowering is finished, fertilizing occasionally with an all-purpose fertilizer will help keep your poinsettia healthy and promote new growth throughout the year. To learn more about common diseases, symptoms, pests, and how to promote re-flowering, visit our “Consumer Care of Poinsettias” fact sheet.